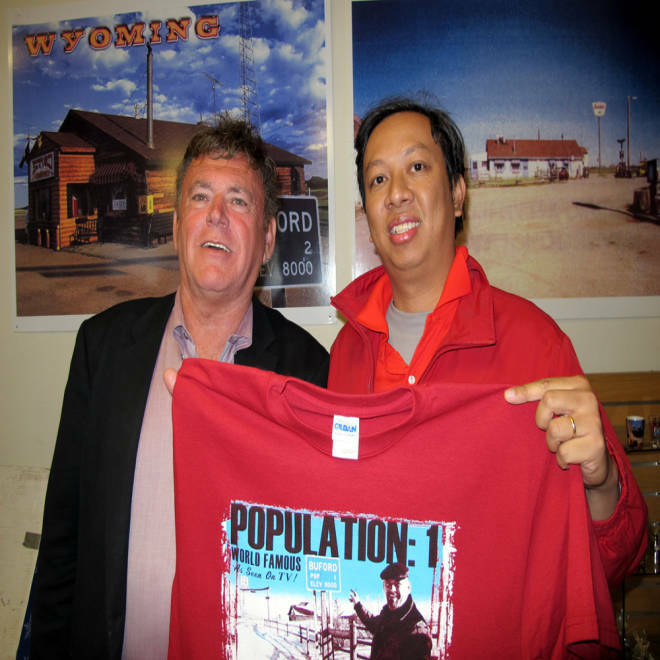 Vietnamese businessman Pham Dinh Nguyen, right, poses with Don Sammons, who was the self-proclaimed "mayor" and sole inhabitant of Buford, Wyo., after Nguyen bought the town in 2012. The tiny Wyoming town of Buford, which was sold at auction last year by its sole resident amid international fanfare, will officially re-open this week as a hub for the sale of coffee distributed by its new Vietnamese owner. In an on-site and Internet auction in April 2012, Nguyen Dinh Pham, 38, offered a winning bid of $900,000 for the town, billed by auction organizers as the nation's smallest, at just over 10 acres. The high-elevation hamlet -- 8,000 feet above sea level on Interstate 80 in southeastern Wyoming -- came complete with a convenience store, gas station and modular home, as well as its own ZIP code. It sprang to life in the 1860s as a military fort to guard the building of the transcontinental railroad and sported a population of as much as 2,000 in the decades that followed. Buford -- recognized as a town by the U.S. Postal Service and Wyoming's Department of Transportation -- was sought by bidders from 46 countries during the auction, streamed live over the Internet. Pham, an importer from Ho Chi Minh City, bought Buford from its single resident, Don Sammons, to fulfill a dream of land ownership and business independence, and his trip to attend the auction in person was his first to the United States. "I thought Buford was very amazing and very exciting," Pham said. "After I purchased it, I kept thinking about what to do with the town." This past March, Pham and an associate, Tuan Do, created a company, PhinDeli Corp, to produce and sell Vietnamese coffee and to establish the brand in Buford. Don Sammons is hanging up his hat as mayor, store clerk and mechanic of Buford, Wyoming – the entire town is up for sale. NBC's Kristen Dahlgren reports. PhinDeli roughly translates as "delicious filter coffee," WyomingNews.com reported on Sunday, citing a U.S. marketing representative retained by Pham. In Vietnam, coffee is typically brewed using a metal filter. The coffee will be shipped from Vietnam to Buford, where it will be available to buy but also distributed to warehouses in the United States and sold through Amazon.com, Pham and Do said. Pham has hired Sammons, a 63-year-old Vietnam War veteran, to oversee the operation from his nearby base in Loveland, Colorado, and has named him co-mayor. For Sammons, the re-opening ceremony, planned for Tuesday in Buford, is a reassuring sign a town he ran for more than two decades will continue on. "The world came to Buford," he said of international tourists who stopped for gas and snacks at the town, on I-80, a 2,900-mile highway between New York City and San Francisco. "Now, Buford will go to the world." Sammons and his wife moved from Los Angeles to a ranch near Buford in 1980 seeking a rural lifestyle. The couple arrived in the conservative ranching community in a lipstick red Lincoln Continental that was ill-suited to the area's deep snows and high winds, and people in the area believed the transplants would soon move out. "They gave us six months," Sammons said. Sammons, after selling Buford last year, thought he had said his last goodbye to the place, where his wife died in 1986. But when Pham invited him earlier this year to take part in the venture, he signed on. Betty Schroll, 93, who splits her time between Cheyenne, the state capital, and a cabin near Buford and whose ancestors settled the area, said she can remember her father taking her to Buford in the family's 1920 Dodge. "I used to go there for an ice cream cone; now I'll go for coffee," she said.